The House of Virgin Mary - The Vatican has recognized this small house in the Solmissos Mountains as the final resting place of the Virgin Mary. A small shrine dedicated to St. Mary was found when the ruins of the house were first discovered. From Kusadasi, you travel to the Ephesus by passing the Byzantine fortress at Selcuk and the ruins of the Temple of Artemis then continue to the Ephesus and Terrace Houses. After the visit drive down to Ephesus's lower gate and drive to House of Virgin Mary. By the end of touring, return to Kusadasi. 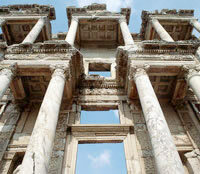 - Approximate time to reach to Ephesus is 20 minutes. - If required, lunch is USD 15 pp.